It can seem a little silly starting traditions so young. He won't remember and cannot take part in most activities aside from being present and watching. I want to start now anyway so it is something that has always been so for him. I thrived on rhythm and traditions growing up, and still love them as an adult. 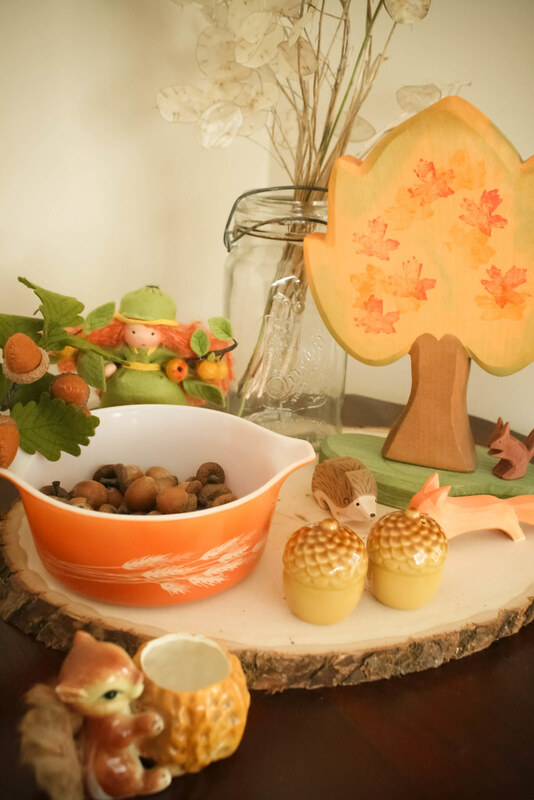 One of these traditions I wanted to start is a seasonal table, or nature table. I've seen these most often within Waldorf families, and it's a way to celebrate the season by being aware of what is happening around us, being present in the rhythm of the seasons, and to bring elements inside. This post is a little late coming as the Fall season is on its way out and these pictures were taken back when it was in full swing. Searching on pinterest or flickr there are many beautiful examples. Some are filled with man made objects that represent the current season, some are filled with items only from nature, and others are a mix of both. Some are elaborate displays that tell a story, and others have items displayed at random. Right now ours is a mix of both. 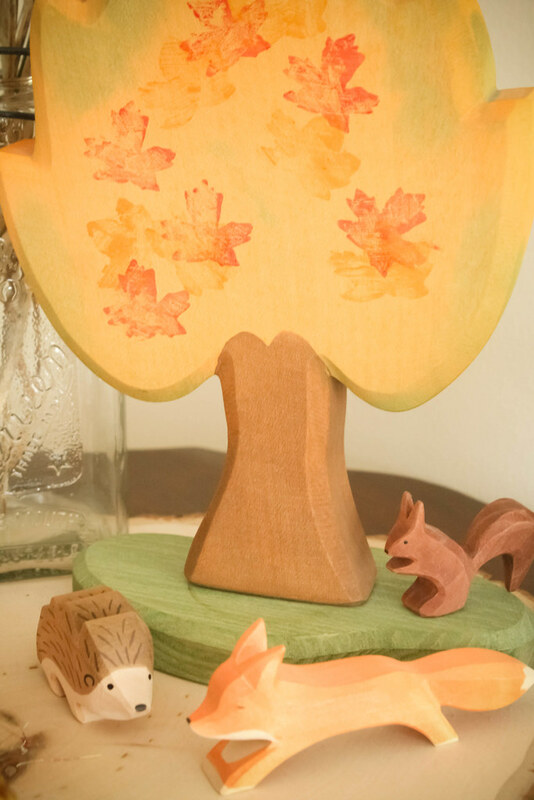 The tree slice is from one of the centerpieces at our wedding, the wood figures and tree are toys that will belong to Josh when he's a little older, the Waldorf apple doll is from Etsy, the Autumn Harvest Pyrex (had to have a bit of that in there! 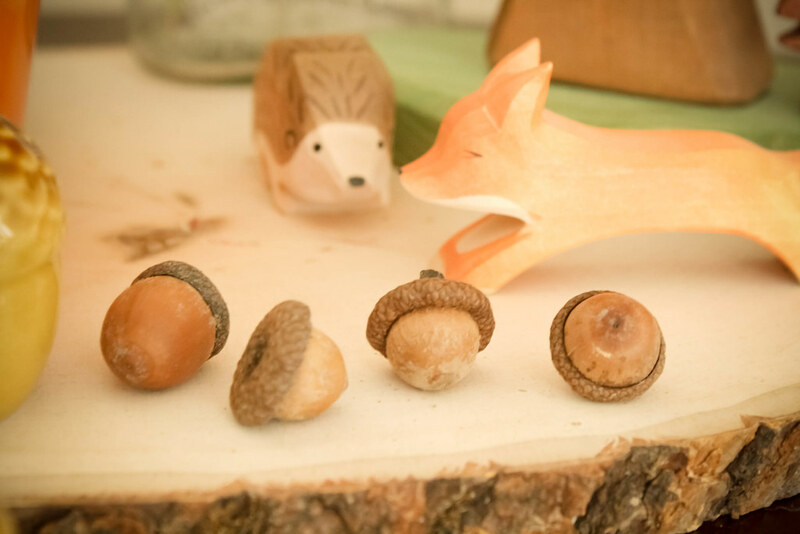 ), acorn salt & pepper shakers, and the little squirrel planter were thrifted, the acorns were collected at my cousin's cottage, and the money plant cuttings were a gift from a family friend. Jer and I added some mini pumpkins after our pumpkin farm outing. As well as being a fun tradition and ever changing display, I think it's a great starting off point for many activities and learning opportunities. It is something that Josh will be able to contribute to as much as he likes as he grows. I cannot wait to start new traditions with him and continue the old with him now involved.